As the sharp eyed amongst you may have noticed, it’s been all change at Bike Science recently with our move to not one, but THREE new brands! Here’s the first in a series of blog posts featuring some of our new machines. Specification, pricing, features, and all the best bits. First up it’s the bike we believe is going to be a big hit with triathletes this year. The 2012 Kuota K-Factor. The Kuota K-Factor is the latest evolution of Kuota’s best selling triathlon/time trial bike. Full carbon frame, carbon fork, carbon aero seatpost, the works! Excellent value for money, highly adjustable and a moderate riding position make this bike a winner with triathletes everywhere. As bike fitters we spend a lot of our time attempting to get riders into comfortable, sustainable aero positions. The K-Factor offers something that’s hard to find in today’s world of pro tour inspired, elite athlete focused time trial and tri bikes; a geometry that’s triathlon friendly for “normal” age group athletes. The frame geometry features tall stack height and short reach, meaning it’s relatively easy for us as bike fitters to get riders into positions that are suitable for triathlons of all distances up to Ironman and beyond. The result? A tri position you can actually use and run off the bike with ease. A great choice for athletes with long legs too who struggle to get their bars in a manageable position. 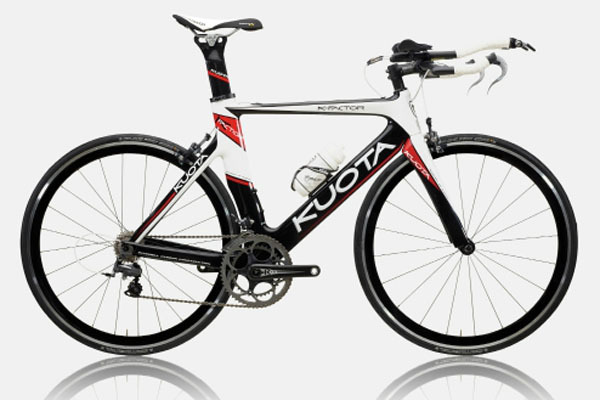 This entry was posted on Thursday, May 3rd, 2012 at 10:33 am	and is filed under Kuota Bikes. You can follow any responses to this entry through the RSS 2.0 feed. Both comments and pings are currently closed.